Do you remember the first time you tried streaming? Maybe it was the hot topic of conversation on your college campus. “Netflix launched this thing where you don’t have to mail-in your movies anymore. They call it streaming… whatever that means.” Or maybe your tech-savvy significant other came home telling you how “everything has changed” when it comes to movie-watching. No matter your story, we’ve all come a long way since the early days of streaming. Connectivity issues like slow Wi-Fi made it difficult to get through an entire movie without the dreaded buffering icon or the “frozen” screen. Jump to today, you can pretty much stream anything. From live sporting events on a streaming service to The Andy Griffith Show reruns on Netflix, there’s content for all interests, backgrounds, and more. With all of these options for streaming, figuring out which is best for you can be a little overwhelming. That’s okay. We can help. We’re inspired by the new possibilities of everyday technology, and we’re here to share our knowledge with you. Up next in our Explained series, we’re looking at the ins and outs of streaming. Let’s start with the basics. Streaming is a technology that sends video over the internet to devices like computers, smart TVs, and phones. It sends data almost instantly which allows people to watch or listen at home or on the go. It gives people the flexibility to watch whenever and wherever, and its capabilities continue to grow. It looks like a regular TV, but a Smart TV has more options. 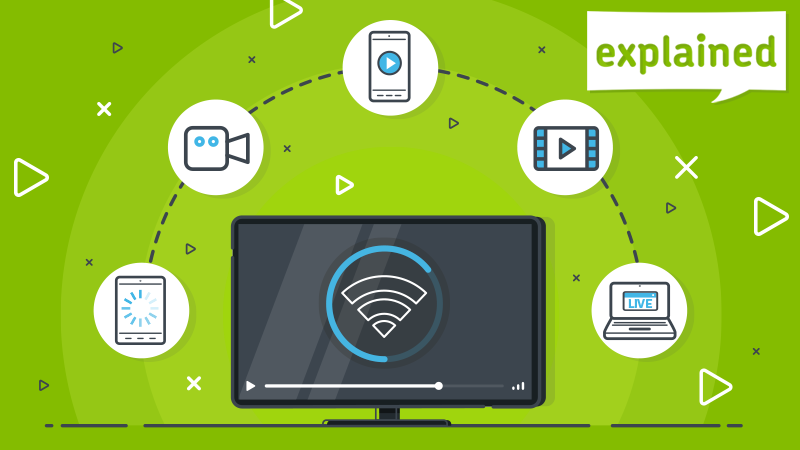 They connect to the internet through Wi-Fi which allows you to stream content from services like Amazon Prime Video and YouTube through apps (just like a smartphone or tablet). A part from streaming your favorite shows and watching live TV through various streaming services — you can also browse the internet directly from your Smart TV. Push the menu button on your TV remote. Select Nework Settings > set up a wireless connection. Choose your wireless network name from the list on the screen. Type your Wi-Fi password using the TV remote. Once you’re connected to the internet, you can add apps to your home screen of your favorite streaming services. Do I need a Smart TV to watch Netflix or Hulu? A Smart TV is one way you can stream services like Netflix, Hulu, or HBO, but no – you don’t have to have a Smart TV to be able to stream. Streaming devices like the Apple TV or Roku connect your TV to the internet and allows you to stream video through those services. You can also use a number of different smart devices to stream. Can I have a cable or satellite package and still use a streaming service? Yes. In fact, you’re in the majority. Most households have a traditional pay TV option and at least one streaming subscription. In some cases, you may need a cable or satellite subscription to watch certain TV programs through your streaming player. For example — HBO. If you pay for HBO through your cable or satellite provider then you can use the HBO GO app to stream all of their shows. All you need is your cable company login and you’re all set. For those who have cut the cord, don’t worry. You can still watch all your favorite HBO shows with a HBO NOW subscription. Just download the app and you can get back to your Game of Thrones binge-fest. How do I stream my favorite shows from my smartphone or tablet? All of the different streaming services offer apps you can download to your smartphone and tablet. For example, if you’re an Amazon Prime member, you can download the app, log in with your Prime account information, and stream tons of movies and TV shows – from your phone, Kindle, iPad, etc. The biggest benefit to streaming from your smartphone and tablet is that you can do it from anywhere, anytime. However, streaming from your device can cause your battery to drain more quickly — we’ve got you covered with our battery saving tips. Can I watch live TV from my streaming service? It depends on which service you have. Sling TV, Hulu + Live TV, YouTube TV, and DirecTV NOW are just a few examples of streaming services that offer live TV options. Each offers a slightly different channel lineup, so make sure you pick the one that offers the channels that air your must-see shows. If you’re not sure which will work best for you, that’s okay! They all offer a free trial period. Try each one out and see which one you like. Pro tip: Don’t forget to cancel if you decide it’s not for you. You don’t want to get charged! So now that you’ve got everything hooked up and your preferred streaming method in place, here’s our answers to some frequently asked questions to help you get the most out of your live TV streaming experience. How do I prevent buffering while streaming? If buffering issues do occur, it’s best to wait for it to finish – it’ll most likely pick up where it froze. If you close or refresh the app, it will reload and jump forward to live. Instead, use this time to grab some snacks. Pro tip: stay off social media! You don’t want to run the risk of someone sharing spoilers. If others in your home are planning to binge-watch or play online games instead of joining in for your watch party, you may end up competing for bandwidth. Having multiple people on their devices at the same time can not only slow your speed, but also reduce your streaming quality. Ask them to download their movie or show in advance. That way the Wi-Fi signal will be all yours. Streaming has its advantages, but there’s also one disadvantage worth pointing out: real-time delays (aka latency differential if you’re fancy). Depending on how you’re choosing to stream live events, the delay can run anywhere from 13 to 39 seconds. Not a huge chunk of time, a lot of things can happen in a matter of seconds. Best way to combat the delay is to turn notifications off on your phone while watching and stay off of social media. Because nothing quite ruins the moment like someone sharing the ending before you’ve had a chance to watch it yourself. Do you have a streaming question? Our experts are here for you, regardless of brand or platform. There’s no question too big or too small, and we share answers without jargon or complexity. Request. Resolve. And get back to doing what you love.